This product requires the base game WWE 2K18 Digital Deluxe Edition. With hard-hitting action, stunning graphics, drama, excitement, game modes, match types, creation capabilities, and everything you’ve come to love from WWE 2K, WWE 2K18 promises to bring you closer to the ring than ever before. Be Like No One.Want even more of the WWE 2K action you love, at an incredible value? 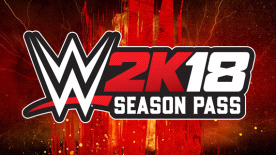 Gain access to thrilling downloadable content, including additional Superstars, move-sets and enhancements with the WWE 2K18 Season Pass!